Nutrient availability from organic sources has been considered “slow release” by many growers and advisers. This may be true in environments are colder and especially soils are cooler. Organic nutrients are dependent on microbes to break down materials and release those nutrients, and when soils are cold, microbes can't do their thing. Soils in much of agricultural California tend to be warm and lack the freezing conditions that occur in many soils in the continental US. Imagine how much microbial activity occurs in the Mid-West when soils cool down to 32 deg F at a four inch depth and deeper. The top layers of soil are where organic matter accumulates and where most microbial activity occurs. When soils cool below 50 deg F, nitrogen leaching becomes less common, because less activity is occurring which also coincides with much less plant growth. Soils in coastal California rarely fall below 50 deg F in the surface layers, so microbial activity is ongoing, all year long. So the question is, how “slow acting” are organic fertilizers? A recent study by Tim Hartz, Richard Smith and Mark Gaskell looked at release rates of injectable organic fertilizer and found that much of the nutrient release occurs within about a week after application depending on the formulation and temperature during the study. The results conform to another study that they did where they evaluated the nitrogen release rates of dry formulations of organic fertilizers – compost, manures, feather meal, etc. Aside from the issues of the higher costs of these materials and their potential clogging, there is the issue of application timing. In the case of avocados and citrus, adequate levels of nitrogen are needed in the trees going into to fruit set in order to optimize set. And then after fruit set, in order to maintain growth into the fast growth period, again nitrogen needs to be adequate. Using organic fertilizers with a rapid conversion to useable forms of nitrogen, means that application timing should coincide with these critical periods in tree phenology or growth cycle. Using information on organic nutrient management based on work from cold soil climates needs to be carefully evaluated before applying it to California soils. One of the most common problems in organic production is nitrogen management. Part of the problem is the cost of supplemental nitrogen amendments, but also learning to anticipate when that applied nutrient becomes available to the plant. Developing better estimates for local release rates and patterns will better help manage organic nutrient sources. Summary: Limited soil nitrogen (N) availability is a common problem in organic vegetable production that often necessitates additional N fertilization. The increasing use of drip irrigation has created a demand for liquid organic fertilizers that can be applied with irrigation. The N availability of three liquid organic fertilizers was evaluated in an incubation study and a greenhouse bioassay. Phytamin 801 contained fishery wastes and seabird guano, while Phytamin 421 and Biolyzer were formulated from plant materials. 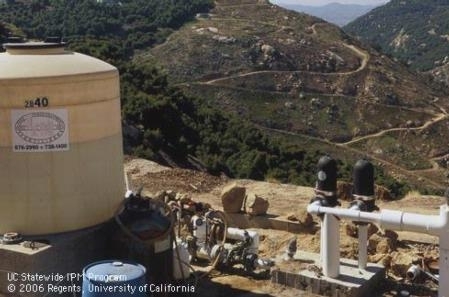 The fertilizers ranged from 26 to 60 g·kg−1 N, 8% to 21% of which was associated with particulate matter large enough to potentially be removed by drip irrigation system filtration. The fertilizers were incubated aerobically in two organically managed soils at constant moisture at 15 and 25 °C, and sampled for mineral N concentration after 1, 2, and 4 weeks. In the greenhouse study, these fertilizers and an inorganic fertilizer (ammonium sulfate) were applied to pots of the two organically managed soils with established fescue (Festuca arundinacea) turf; the N content of clippings was compared with that from unfertilized pots after 2 and 4 weeks of growth. Across soils and incubation temperatures, the N availability from Phytamin 801 ranged from 79% to 93% of the initial N content after 1 week, and 83% to 99% after 4 weeks. The plant-based fertilizers had significantly lower N availability, but after 4 weeks, had 48% to 92% of initial N in mineral form. Soil and incubation temperature had modest but significant effects on fertilizer N availability. Nitrification was rapid, with >90% of mineral N in nitrate form after 1 week of incubation at 25 °C, or 2 weeks at 15 °C. N recovery in fescue clippings 4 weeks after application averaged 60%, 38%, and 36% of initial N content for Phytamin 801, Phytamin 421, and Biolyzer, respectively, equivalent to or better than the N recovery from ammonium sulfate. Wow,There are so Many Avocados on my Tree! Should I Apply NItrogen at this Time? With the big avocado crop out there, the question came up about whether a grower should add extra nitrogen to encourage more canopy growth to protect the fruit from sunburn or whether that would cause the fruit to drop. There is in our understanding the idea that there is a competition for resources and that in that competition one must best another. A commonly held belief is that if you apply nitrogen at the wrong time it will push resources to vegetative growth at the expense of fruit. This is somewhat true for annual plants that get most of their nutrients from outside sources (soil, air, fertilizer, water), but trees have a huge buffer in their storage organs (roots, stems, leaves, etc.). Most growth in trees occurs from this storage source and most importantly from photosynthesis and the sun. The more sun captured the more energy for flowering and fruit production. In fact a dose of nitrogen fertilizer is a good idea at this time when there are lots of clusters of fruit. This can encourage a flush of leaves that will protect the fruit from sunburn and damage that would cause fruit to drop. Also at this time, persea mite has been building its population and is starting to cause leaf drop. A bit of nitrogen to encourage leaf replacement is a good approach to dealing with this mite damage. At a recent avocado meeting, Carol Lovatt of the Botany Department at UC Riverside pointed out that avocado fruit take up more potassium than nitrogen, almost twice as much, and that much of that uptake occurs later when the fruit is expanding. She reminds growers that all to often, the potassium needs of the tree are overlooked. Click on "attached files, potassium nitrogen uptake" to view graphs. As growers of thousands of ornamentals we understand that minerals absorbed mostly by roots as ions are essential for plant growth and development. Some required in parts per hundred are macro-nutrients while others only required in ppm or ppb are considered micronutrients. As long as enough of the 18 essential minerals are available, plants grow and reproduce in a healthful way. When not enough of one of the essential elements is supplied, a deficiency occurs and plants present symptoms. Mineral nutrient symptoms are considered abiotic disorders. There are however cases where excess or deficiency of elements can be predisposing to disease caused by pathogens. While examples of this are not abundant, some mineral elements do have a role in the development of disease caused by some pathogens. While it is often espoused that the well “fed” or fertilized plant it is resistant to disease it is rarely borne out in any research. Keeping a good nutritional level in nursery stock will not necessarily protect plants from many of the virulent pathogens that are capable of causing disease. Nitrogen fertilization can produce succulent growth that will lead to exacerbation of such diseases as powdery mildew (Powel and Lindquist, 1997). Too many mineral nutrients may only result in luxury consumption by the fertilized plant or may cause other problems. It has long been known that seedling disease caused by Rhizoctonia solani increases with increased salinity in media (Baker, 1957) and later discovered by Jim Macdonald and others (1984), that salinity increases susceptibility of ornamental plants to Phytophthora. Two basic plant resistance mechanisms that mineral nutrition can affect in plants are: 1.) formation of mechanical barriers (cell wall strengthening) and 2.) synthesis of defense compounds that protect against pathogens (Spann and Schumann, 2010). The role of specific elements and their compounds is much more complicated. Certainly deficiencies of molecules such as Calcium and Potassium can interrupt either of these defense mechanisms. Root rot is a disease of thousands of ornamental plants and a serious problem in most nurseries. Root rots caused by Phytophthora spp. occur in a range of nutritional environments and pH’s. While some studies have implicated nitrogen compounds in the control of Phytophthora these probably involve the release of ammonia which is also toxic to plant roots (Zentmeyer, 1963). Lee and Zentmeyer (1982) later showed that both ammonium and nitrate reduced disease caused by P. cinnamomi , and that low levels of nitrate stimulated production of sporgangia. Most studies have found no relationship of nitrogen source to root rot disease development. Zentmeyer’s early work also suggested a role for calcium in disease reduction caused by Phytophthora root rots. Calcium increases disease resistance to root rot in Avocado (Duvenhage and Kotze, 1991). While it is understood that calcium has direct effects on plant membranes, root cell membrane leakage, cell wall thickness and many other host factors, Messenger (2000), later showed that the calcium ion also has direct effects on Phytophthora, reducing its sporangia size and zoospore mobility. Soils and media low in soluble calcium or where calcium is easily precipitated out of solution, or where pH is high and limestone minerals decrease the availability of calcium, are conducive to Phytophthora root rots. Wilt diseases have also been studied in relation to disease occurrence. Keim and Humphry (1984) showed that nitrogen source reduced the incidence of wilt cause by Fusarium oxysporum f.sp. hebe in Veronica. In their system ammonium sulfate promoted disease and calcium nitrate prevented fusarium infections. In later work on the Fusarium oxysporum wilt disease of Canary Island date palm, Downer and others (2012) found no effect of fertilizer source on disease development (2013 ). Every disease system must be considered independently to determine if nutrient relationships are part of that system. While it is easy to see a role for essential elements in plant defense, non-essential elements may also play a role in some systems. Silicon increases resistance of plants to powdery mildew (Kauss and others, 2003) and root roots (Cherife et al., 1994) and to stress in general (Ma, 2011). Silicon is implicated not only in strengthening cell walls but in defense protein production in plants (Faufeux et al., 2006). Not all plants are capable of utilizing silicon, so its role in plant defense is limited to those species capable of metabolizing it. Much more study is necessary to understand silicon’s role with ornamental plant –pathogen systems. Baker, K.F. 1957. The UC System Producing Healthy Container-Grown Plants. University of California Division of Agricultural Sciences Agricultural Experiment Stations Publication #23. Cherif. M., A. Asselin, and R.R. Belanger. 1994. Defense responses induced by soluble silicon in cucumber roots infected by Phythium spp. Phytopathology 84:236-242. Duvenhage, J.A. and J.M. Kotze. 1991. The influence of calcium on saprophytic growth and pathogenicity of Phytopthora cinnamomi and on resistance of avocado to root rot. South African Avocado Growers Yearbook 14:13-14. Faufeux, F., Remus-Borei, W., J.G. Menzies, and R.R. Belanger. 2006. Silicon and plant disease resistance against pathogenic fungi. FEMS Microbiology letters 249:1-6. Kauss, H. Seehaus, K. Franke, R., Gilbert S., Dietrich R.A., and N. Kroger. 2003. Silica deposition by a strongly cationic proline-rich protein from systemically resistant cucumber plants. Plant J. 33:87-95. Keim, R. and W.A. Humphrey. 1984. Fertilizer helps control Fusarium wilt of Hebe. California Ag. 38:13-14. Lee, B.S. and G.A. Zentmeyer. 1982. Influence of calcium nitrate and ammonium sulfate on Phytophthora root rot of Persea indica. Phytopathology 72:1558-1564. Ma, J.F. 2011. Role of silicon in enhancing the resistance of plants to biotic and abiotic stresses. Macdonald, J.D., T.J. Swiecki, N.S. Blaker, and J.D. Shapiro. 1984. Effects of Salinity stress on the development of Phytophthora root rots. Calif. Agriculture 38:23-24. Messenger, B.J., J.A. Menge, and E. Pond. 2000. Effects of Gypsum on zoospores and sporangia of Phytopthora cinnamomi. Plant Dis. 84:617-621. Zentmeyer,G.A., 1963. Biological control of Phytophthora root rot of avocado with alfalfa meal. Phytopathology 53:1383-1387. 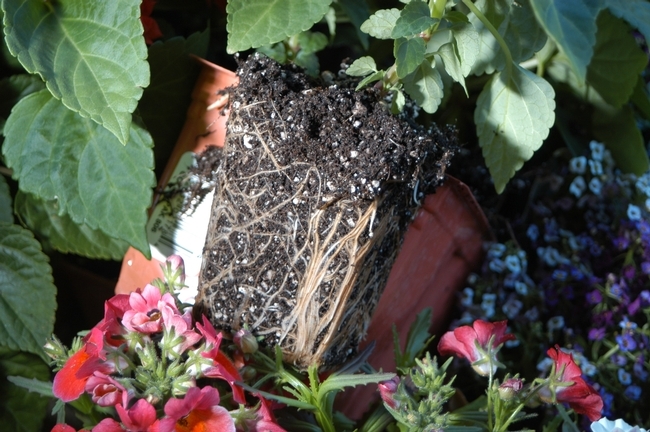 Early onset root rot in color or bedding plants.